We are facing an era of rapid urbanization, with 70% of the world's population expected to be living in urban areas by 2050. As our cities grow at an exponential rate, how will we solve problems like rising pollution, and it's impact on the environment and our health? 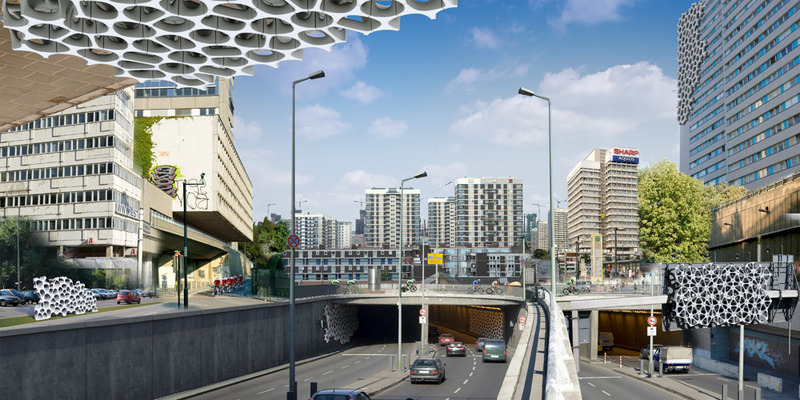 A Berlin based company, Elegant Embellishments, are tackling the problem by producing smog-eating facade panels that combine smart materials, sunlight and intelligent design to combat pollution in cities. The innovative technology is called Prosolve370e, and it's design was inspired by fractals in nature to maximise the surface area to capture pollution and omni-directional light where light is scarce. The modules are coated with a superfine titanium dioxide, and use a pollution-fighting technology activated by ambient daylight that requires only small amounts of naturally occurring UV light and humidity to effectively reduce air pollutants into harmless amounts of carbon dioxide and water. When positioned near pollution sources, the coated tiles break down and neutralize NOx (nitrogen oxides) and VOCs (volatile organic compounds) directly where they are generated. Allison Dring, Co-Founder of Elegant Embellishments, will be speaking at the Connected City Summit about the role of pollution-reducing building facades in our future cities. I caught up with Allison ahead of the event to hear her thoughts on future cities, challenges, smart citizens and more. What was your motivation behind founding Elegant Embellishments? We had spent some time in the early 2000s working as architects in London, and at the time were witnessing a stagnation in the industry caused in part by the dual processes of value engineering and design/build contracts. At the same time the rise of smart materials was signalling new climatic spheres that architecture could interact with. These climatic spheres were also where much of the most pressing ecological imbalances were occurring. As architects, we realized we could integrate technology with the volume of the building industry and potentially have impact. We had an alternate future in mind: where the criteria for building would re-prioritize, and assimilate with conditions: climatic, microscopic, etc. We had an idea about architecture engaging with, and eventually becoming part of the biological world. How have recent technological or scientific developments aided to the progress of Elegant Embellishments? There has been a recognizable shift in technology toward "soft power": flexible, robust, adaptable. For cities it has meant a lesser focus on the hardware: the structures, infrastructure, and more on the environmental or experiential. For us it has meant lessening our focus on the production of matter, and starting to see our work as an application. Our Made From Air project uses basically photosynthesis, which isn't considered a technology, but is the most efficient process in pulling CO2 from the atmosphere, using sunlight. Our work only lies in capturing and harnessing processes and resources that already exist. I think we're starting to live with the idea of scarcity, which is having impact on new technologies. We find materials and processes that can override our thinking, that harness what we already have in abundance. Typically throughout human history, periods of scarcity have produced some of our greatest scientific achievements. Scarcity surrounds the topic of global warming, and scarcity is the design parameter for our endeavors in space- an industry that has had great impact on problem-solving our ecological challenges. The value of waste streams. If we were inhabiting another planet- or even our own in 50 years- we would consider all matter, on all scales and regardless of form. Our civilization has endless abilities to collect, recycle and re-form matter, and urban waste is an ever-abundant material stream. I recently attended a talk by Douglas Coupland, who pointed out that garbage, once something is labeled as such, becomes immediately a part of the past. And to imagine the future, one must consider the garbage of the future. The residue of our future endeavors. Architecture will prioritize performance: from the construction of IoT/sentient building materials, to energy-producing, to the absolute expectation that facades interact with the urban environment. Instead of balancing the energy or carbon equation, we will see buildings giving back, acting as agents of urban improvement. We will see the act of building as a catalyst for positive change- which is an iteration beyond the traditional idea of sustainability. Air is full of matter. Elements of the atmosphere have determinant qualities in our physical spaces and affect our daily health. In terms of resolving our built world with the problems of global warming, the sky is the new territory: how we modify and harvest the environment around and above us has great impact on our physical evolution in cities. As a collective, we can be very productive- an ability that is intensifying as urban climatic issues worsen. Localizing production within city clusters decentralizes manufacturing. An example with our Made From Air project is the reactor: one version is a simple double-barrel oven, becoming a popular DIY project for people going off-grid. Neighborhood clusters, each with their own reactor could convert their garden waste into biochar, which produces heat that can be collected, and a bio-fuel. It is also construction material, a soil enhancer, etc. Endless opportunities for increasingly skilled communities. At the conclusion of COP21, it was clear the ability of a policy maker to set the agenda for reducing global warming is limited. Private companies have the might to ignore or work around the regulatory sphere, and private companies have the only real means to scale up potential solutions. So what's the incentive? The overriding message from COP21 was to keep solutions quiet, in order to focus intensity on behavioural change. Real technological change needs to find a place in the global conversation. Allison Dring will be speaking at the 3rd annual RE•WORK Connected City Summit in London on 16-17 March 2016. Other speakers include Julie Alexander, Siemens; Paul Wilson, Bristol is Open; Lauren Kemball-Cook, Pavegen; Kevin Menice, BigBelly and more.